Okay, you know it’s true, I was an idealist, an antagonist to the Powers-That-Be, and that was my reputation, my glass ceiling, coming into the 1993 city-wide Mayor’s Race. But inside my District I was known as a pragmatic “bring home the bacon,” get things accomplished kind of legislator, like urban homesteading, community prosecuting, and the Minnesota Supreme Court Task Force on Racial Bias in the Courts (which led to evening out the State’s criminal penalties for drug offenses and making sure about accurate translating in our court rooms, among other things). At the top of my pragmatic Neighborhoods Agenda was Minnesota Youth Works, the predecessor to Bill Clinton’s Americorps Program. Clinton wasn’t President yet when a high school kid, after hearing my idea, christened it “Minnesota Youth Works.” I am particularly proud of this legislation because it was of the kids, by the kids, for the kids, written by the kids, named by the kids, and lobbied by the kids. What the kids had me write up was based on telling them my experience working for Voyage House at low wages right after college (see “What I did with My College Education”) helping runaways and throw-aways because I didn’t have to worry about getting the kind of job that paid enough to pay-back college loans. What we ended up drafting was a bill to match the enormous talents and resources of young people to the ever-increasing needs of our troubled communities, to demonstrate the connection between providing opportunities for at-risk youth and reducing crime rates. My political philosophy has always been: Equality of Opportunity; Not Necessarily Equality of Outcome. I gathered together a group of high school and college students from around the State and asked them what Pres. JFK had earlier asked me and my generation: “Ask not what your country can do for you; ask what you can do for your country.” Together, me, the kids, and my colleagues proposed and passed a program to provide participants the opportunity to assess community needs and perform community service to meet those unmet needs, in return for a small stipend and a reduced-cost college education. This is the nuts & bolts kind of thing my District was expecting: Provide some of our out-of-school, out-of-work, young people with a chance by asking what they’d like to do to better their community and better themselves. We ended up with a modern day Civilian Conservation Corps of tutors, reading volunteers, tree-planters, youth basketball coaches, after-school dance instructors, senior chore aides, and eventually more college grads. But getting it passed with a Ten Million Dollar ($10,000,000) start-up fund took some work. The House Speaker got on board early and designated it House File #2, indicating it was a caucus priority. My Best Buddy Legislator, another co-author, got his college intern to organize a state-wide, seven city press conference tour, with high school students in every town telling their local media why they wanted their local legislators to vote for the bill. In part of the press conference I used the JFK quote and described the great injustice of graduating from college with so much debt you couldn’t be what you wanted to be. Best Buddy Legislator Howard Orenstein then described the huge cost to our State having to build new prisons, and linked passage of our legislation to reduced crime and safer communities. In the end it was the young people themselves who got the money appropriated. Their presence was felt throughout the session right down to the last night sitting in the hearing room where the appropriation vote was to take place. They got the money they wanted. 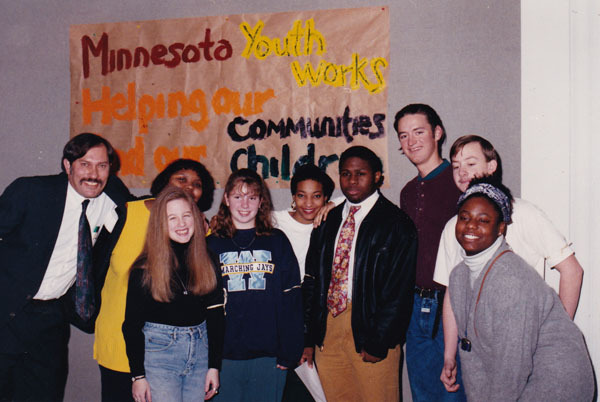 Youth Works was later merged with Clinton’s Americorps Program resulting in thousands of Minnesota college students getting help with their tuition costs, but the injustice of mountainous college debt has not gone away for many middle-class Americans. A growing number of older Americans are saddled with the loans they co-signed to help their children pay for a college education. Come on Jack & Nick! Come on you young guys! Let’s do something!